Jesus with His twelve disciples. MANY PEOPLE BESIDESthe fishermen and Philip and Nathaniel and Matthew, the publican, followed Jesus. His teachings were so wonderful that others wished to be learners, or disciples, of him, and so they followed in his company from one place to another.But the time came when Jesus wished to choose from among their number twelve men whom he could prepare to help in his great work. These men he wished to send out to places where he had never yet been, and have them preach to the people in those places about the kingdom of God. Although Jesus could see the hearts of all men, yet he felt that he needed help from God to know which of his followers he should choose to be among his twelve helpers. So one night he went away quietly and climbed up the slope of a mountain, where no one would be near to disturb him. There he knelt down to pray, and all night he prayed to God for help and wisdom, and for strength to do his work. When morning light returned Jesus was ready to chose his helpers, so he left his place of prayer and joined the company of disciples who were waiting in the valley for his coming. From them he choose Simon whom he called Peter, and Andrew, the brother who first brought Simon to Jesus. Then he chose James and John, the fishermen who had been partners with Simon and Andrew at the seaside. Afterwards he chose Matthew, the publican, and Philip and Nathaniel, of Capernaum, and Thomas, and another James, who was the son of Alphaeus, and another Simon, also called Zelotes, then Judas the brother of James, and last of all Judas Iscariot, who finally sold his Lord. 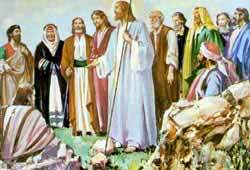 To these twelve men Jesus gave power to cure diseases and to cast out devils. He also appointed them to preach the kingdom of God. And he called them his apostles which means those who are sent out. Because he sent them out to preach to other men. Of these twelve apostles we read the most about Simon Peter, James, John, Andrew, Matthew, Philip, and Thomas. Little mention is made of the others, except of Judas Iscariot, who near the end of Jesus’ ministry became untrue and betrayed Jesus by selling him for money.